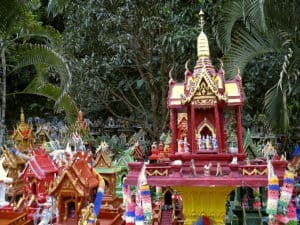 Evincing the unique blend of animism, Hinduism and Buddhism that makes Thailand so interesting, Thai spirit houses are miniature abodes for the spirits of the land (‘phra phum’). Made of wood, or more often nowadays, cement, they are carefully sited by a spiritual ‘specialist’ on an auspicious corner of a property, outside the shadow of the main dwelling. Daily offerings are made and can comprise flowers, fruit, incense, betel, tobacco, candles as well as assorted foods and drink. 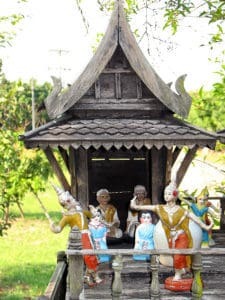 These serve to appease the spirits, keeping their mischief to a minimum and bringing good luck and prosperity to the human inhabitants of the property. 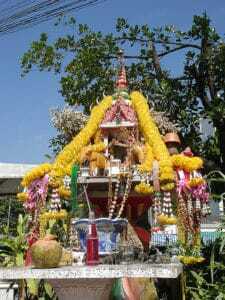 Often the spirit house will be appointed with figurines of the guardian spirits (‘jao tii’, or Lord of the Land) represented by an old man and woman, along with those of other attendants- angels, dancing girls, elephants, horses, etc.Less often, one will see one of the Hindu deities represented, such as Lord Brahma in the spirit house at the back of the Chiang Mai Night Bazaar. This is also the deity featured in the famous Erawan Shrine in Bangkok. 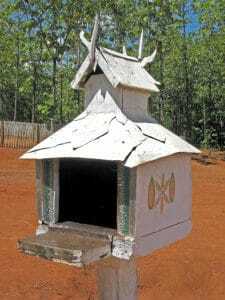 The designs of spirit houses can take various forms: temple buildings, pavilions, and typical residences of the area. 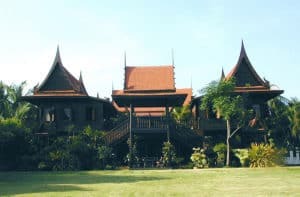 The Buddhist temple main sanctuary is a popular style, and is usually found in wood in Northern Thailand. Temple designs incorporating the Khmer ‘prang’, or corncob-like tower which represents Mount Meru of Hindu mythology, are also popular, and are often rendered in cement. House designs can be simple affairs, such as seen in a Palaung tribal village near Chiang Dao. 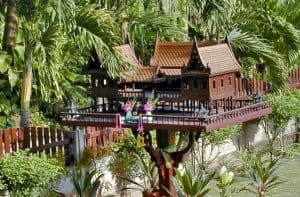 They can mimic the local architectural style, or they can even be miniature versions of the main human abode, as shown here at Thai House, the famous cooking school in Nontaburi. 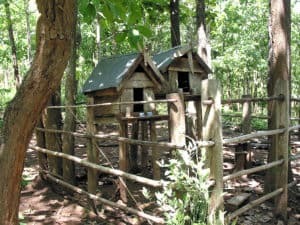 Spirit houses can also be erected at businesses, beside sacred trees, or along the highway – anywhere that the spirits need special care and appeasement. 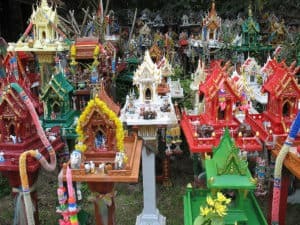 This photo shows part of the enormous collection at a hilltop shrine beside the highway between Lampang and Chiang Mai. 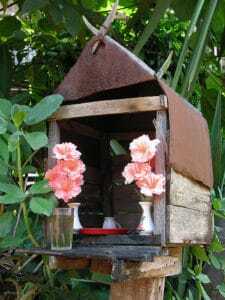 Villages will often have their own special home for ‘jao phaw’, or spirit for the village. 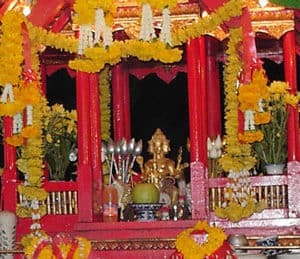 Usually located at the edge of the settlement, it is used for special rituals to repel malevolence and misfortune, and bring prosperity and security to the village. We currently have one contemporary spirit house here.